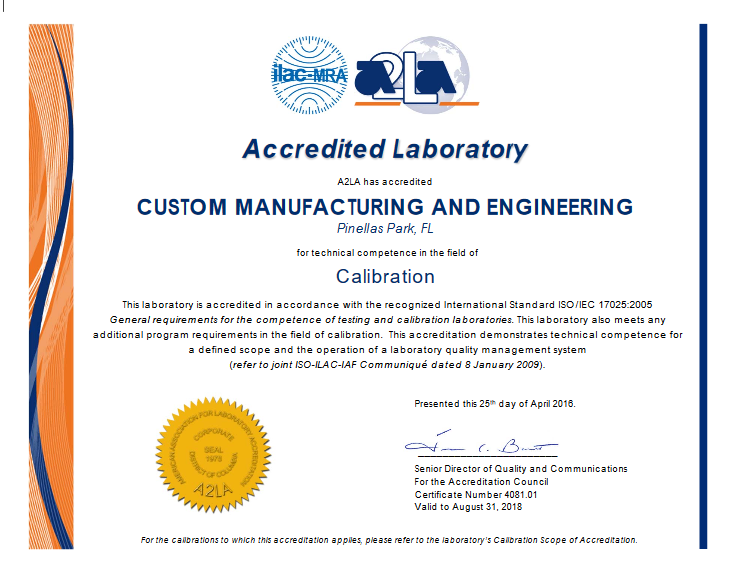 Calibration - Custom Manufacturing & Engineering Inc.
Everyone needs precise and accurate pressure measurements to ensure safety, compliance, and efficiency. CME is ready to help you with our A2LA accredited ISO 17025 Calibration Lab for calibration or repairs. Should you require Certificates of Compliance (CoC) on all calibrations to NIST traceable standards we will be happy to provide you one. CME's expertise includes certifications in AS9100D with ISO 9001:2015 and ISO/IEC 17025. Our calibration, repair, and refurbishment experience and capabilities include: manufacturing a RVSM capable ADTS 415F (Air Data Test Set) now used by the U.S. Air Force as well as servicing primary and secondary pressure measurement systems. For a comprehensive list of equipment we service, please click here. ​Most air data test set are used to measure pitot and static air flow requiring annual calibration and certification, while newer data test set like the Barfield DPS1000 require 18 month calibrations intervals. Pressure/Vacuum: Air Data Test Sets / Pitot Static Test Sets Pressure Controllers, Calibrators/Indicators Gauges and Transducers Air Data Test Sets / Pitot Static Test Sets Electrical/Electronic & Electro-mechanical assemblies: Control Panel/Rack Mount Instrument Repairs PC Board repair to component level Power Supplies & Distribution Equipment Test Measurement & Diagnostics Equipment/Special Test Equipment Ground Support Equipment. From time to time, customers may need their equipment repaired or refurbished. Should you need help maintaining, adjusting, configuring, programming, and repairing your equipment our highly-trained technicians are ready to assist you. Should you need it, CME can perform system testing, simulation, and debugging of your equipment for modifications and upgrades. If you have any repair and refurbishment questions, we invite you to contact our talented staff so we can address all your requirements. Migration/modernization support for legacy and obsolescence. To Request a Quote for Calibration or Maintenance/Repair Service today or email: sales@custom-mfg-eng.com or Call: 727-547-9799 Ext. 1202.